The new Silver Z range that was introduced last year broadens in early 2019. We proudly present the third pure fiberglass Silver, the Tiger BRz. 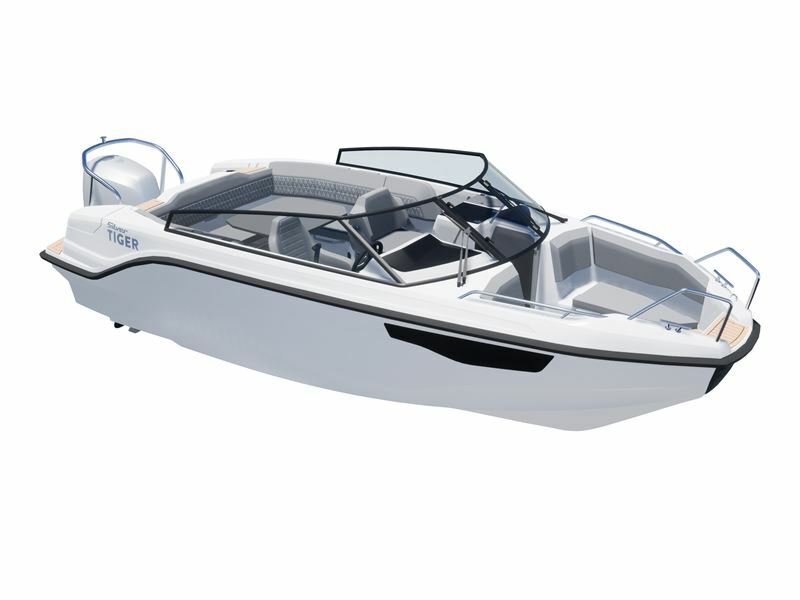 Tiger BRz, which is the only Bow Rider in the Z range, is made onto the same hull as its sister model Tiger DCz. This novelty model will be launched at the Helsinki Vene19 boat show in stand 6h50. The hull design of the new Tiger BRz follows closely in the footsteps of the two Z models already published. The hull uses the unique Swedish Petestep® technology, thanks to which the boat runs higher on the water than traditional V-hulled boats, with a smaller wet surface, making the rides both smoother and more quiet. Simultaneously the Petestep® hull makes the boat surprisingly dry from sea sprays. Interior-wise the color scheme is calm and timeless in a sophisticated greytone, and the materials overall are high-quality. The stylish brown-toned composite teak deck is a more environmental friendly alternative to real teak, at the same time as it’s easier to clean and maintain. The open bow is ample and versatile, and includes large storage compartments and additional seating. There is also a separate decked storage box for mooring lines. The sturdy bow rails and distinct steps make it safe to embark the boat, and the standardly fitted bumper in the very bow overlooks small bumps when beaching. As additional accessory it is possible to get an effective spotlight for the bow that can help you navigate in the dark. The pilot’s area has been designed with ergonomics and practicality in mind. All meters, switches and the standardly fitted 9” Raymarine Axiom chartplotter have been mounted perfectly into the pilot’s field of view, but without masking viewability forward. The streamlined windshield that extends along the sides of the boat effectively helps keep airflow away from the passengers travelling in the back. The stern has been fitted with a U-shaped sofa, which is easy to transform into a large sunbed using the separate table that is part of the standard equipment. All passengers fit comfortably around the table and underneath the sofa there’s plenty of storage space for bags and equipment. The storage compartments are lockable with ready-installed Abloy locks, so rest assured that you can leave belongings in the boat even for longer periods of time. The pantry in the co-pilot’s console adds to the comfort as it can be fitted with a tap and a portable gas stove (additional accessories). The decked fender storage compartments in the aft corners are a familiar detail from the other Silver Z models. The standard accessory set of the Tiger BRz is very comprehensive. The price includes e.g. the table for the stern (including the sunbed), a 9” Raymarine Axiom chartplotter with touch display, a 2-part stern canopy, hydraulic steering, the fenders with fender lines, the stern cushion set and the bow bumper. For added comfort you can choose between several additional accessories, such as a drawer fridge, a Webasto heater, a fresh water system, a double battery system and the luminous spotlight for the bow. Silver Tiger BRz is a modern and welcome addition to the segment of fiberglass Bow Riders. The boat is quite an extraordinary boat in its size range, especially thanks to its patented Petestep® hull, but also because its apprearance clearly sets it apart from the other bow riders on the market. The new Tiger BRz brings a tad of animalistic power into the bow rider segment.